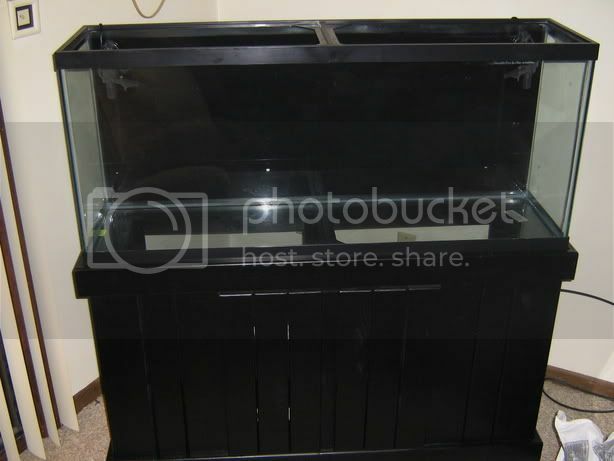 I would like to start a journal of my 55 gallon FOWLR saltwater tank. Here are the pictures from when I started setting up this tank about two weeks ago and up until now. That's too many fish I think. Maybe not, if PB is going for Base Rock then topping off with Live Rock then the "Liveness" from the Live Rock will spread onto the Base Rock. 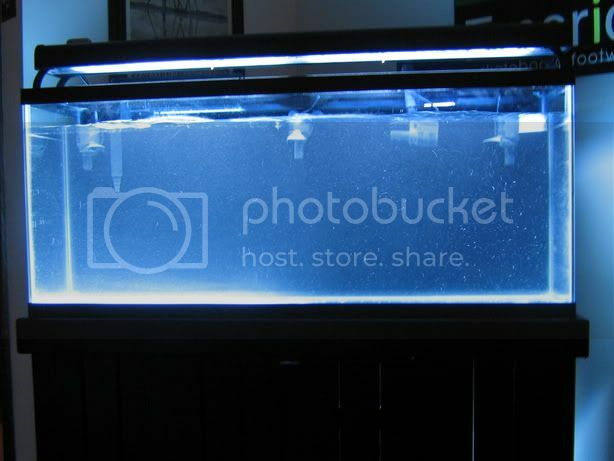 55g is still quite a lot of water, and with the right skimming, filtration and maintenance it is likely to be possible. All of the fish in that list are smaller than a couple of inches, apart from the Bicolour Angelfish which I suppose is fine due to the size of the other fish. Let me comment on all your different concerns. 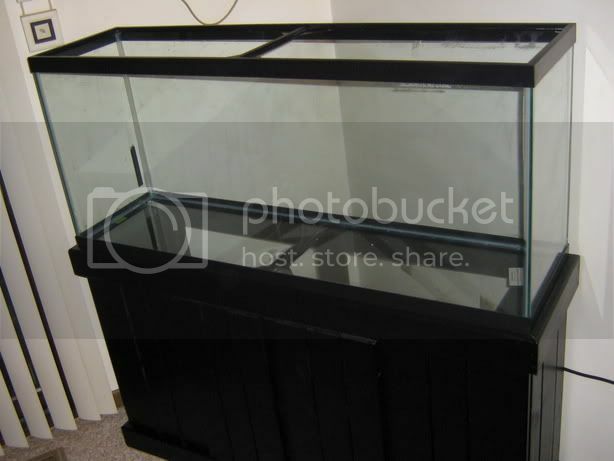 I am using a Remora protein skimmer which is a very powerful and efficient protein skimmer rated for up to a 75 gallon tank, so handling my 55 gallon tank with a somewhat small bioload will be no problem. 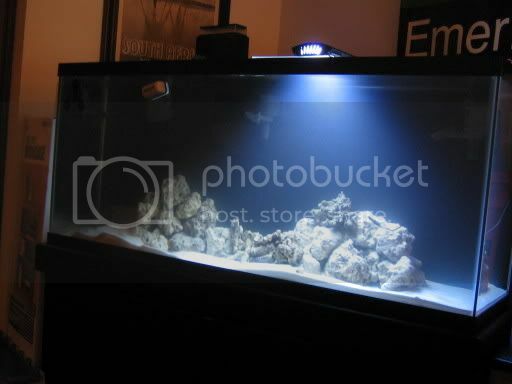 I know 2lbs of live rock seems insufficient for a 55 gallon tank, but I bought more porous rock which means I bought larger peices of rock rather than smaller dense rock, so basically more surface area for algae and living organisms to thrive. 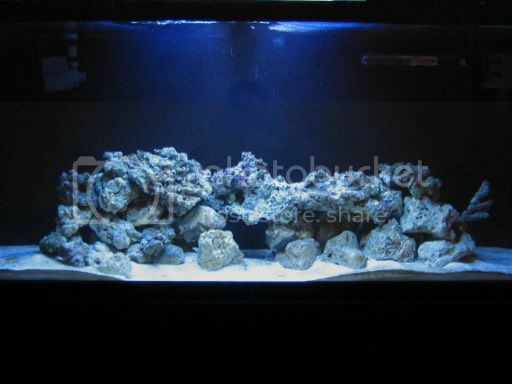 I am also going to add 30lbs of base rock and place the live rock inbetween and ontop of the base rock and overtime the live rock will seed the base rock. I am also running a AquaClear 110 power filter with Carbon and Biomax for added filtration. I am also very religious about my water changes so I will be doing around 15-20% water changes every week and will also have a good cleanup crew consisting of Nassarius snails, Hermits, Turbo snails, a Serpent Starfish, and a Fighting Conch. The reason why I chose this cleanup crew is because of the following reasons. Nassarius snails and Serpent starfish: These critters will be the sand sifters. They will consume uneaten food, decaying organics, and fish waste. Also they will airate the sand breaking up any gas bubbles there might be. Hermit crabs: Will mostly eat various kinds of algae off the sand and the rock structure. Turbo snails: Will mostly consume algae from off the sides of the tank and the rock structure. Great for cleaning hair algae. Tonga Fighting Conch: Will clean cyano, hair algae, and diatoms off of the sand bed. I also want to comment on my stocking plan. 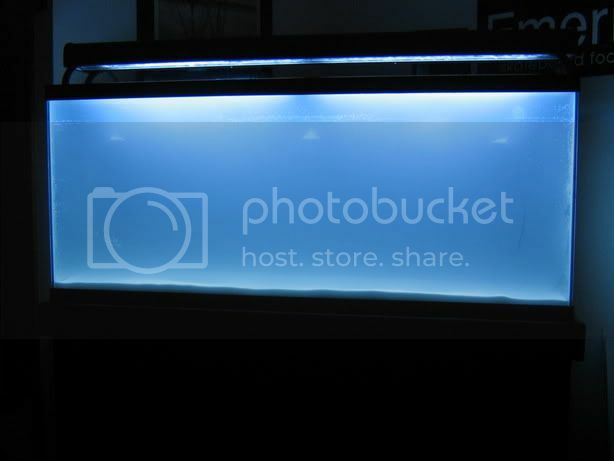 I will be adding small fish such as the Chromis and Clownfish which contribute a small bioload. The Angelfish will be one of the last fish added and if I do decide to add a Blenny it will be the last fish added and only once the tank is well established. 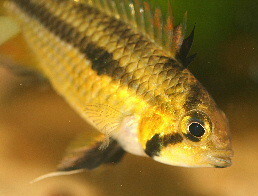 When I do add fish I will be adding fish very slowly alowing time inbetween each new fish for the tank to settle down. Although you never commented on this but I have 3 Maxijet 1200's pointed at various spots in the tank to reach any dead spots that there will be. I apologize for my spelling but it is late and I need some sleep. I'll see you all later. I'm glad that you will be following my thread. I should have more pictures once the base rock arrives. 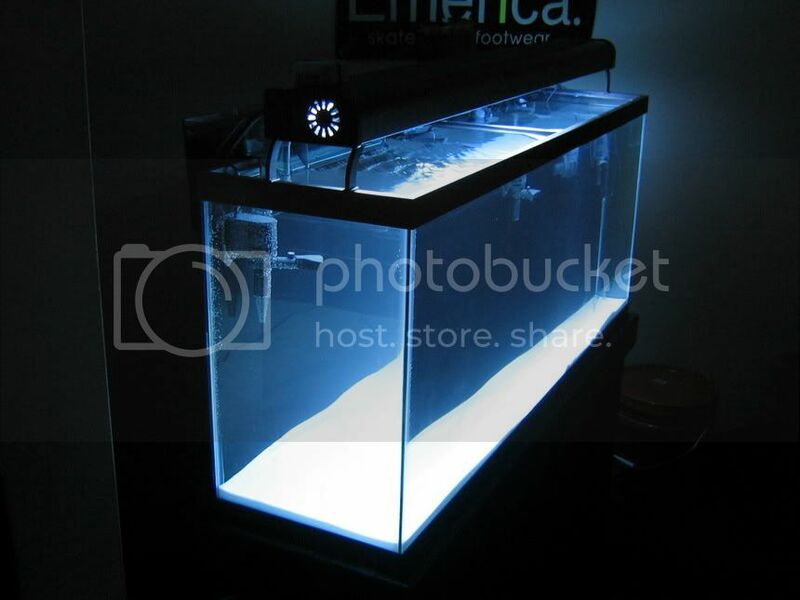 I have decided to upgrade my lighting and possibly add a refugium later on down the road. For upgrading my lighting I was thinking of getting a canopy custom made by Socalcreations and taking apart the Current USA fixture and mounting it into the canopy and I will purchase a 4x55watt kit from AHsupply and also mount that into the canopy. That would give me around 6.2wpg. This is great, sounds like you've done some research for this as far as not spending a fortune for stuff you don't need. From AHSupply I guess you are in the US. They have nice retro fit kits and very reasonable. A reliable company also, I had a 6700K burn out only after 6 months and they replaced it, no questions asked. A few pounds of Live Rock to 90% base is the way to go I would think. If everything is in sync. and the base becoming live would be a sign you are doing something right. 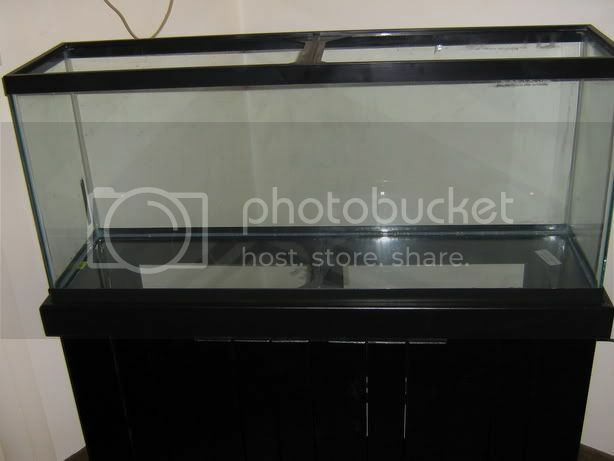 I have a 125G originally bought (used) for a reef, but desided to go with Mbuna. Lately, I have really considered going reef again. I have always wanted a reef and with limited time I don't think I could manage both Mbuna and Reef. 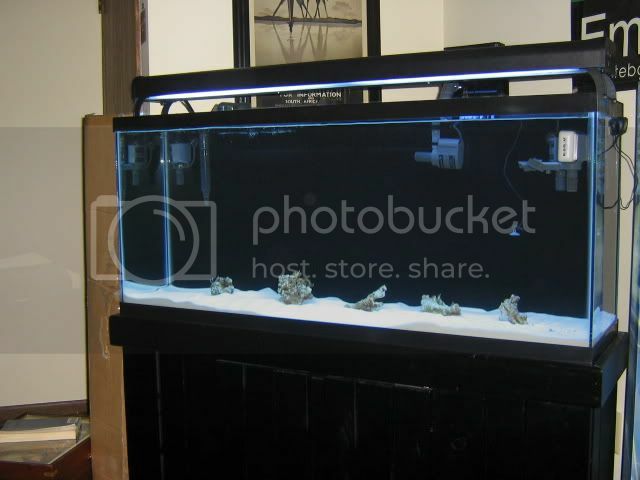 I have found alot of ways to save money with lighting by not buying the fixtures from aquarium stores and making my own base rock out of cement and aragonite or calicite sand. Another thing is buying the sand. I live on a coastal state so there is always the shoreline an hour and a half away or more easily(and probably less expensive due to gas prices) some landscaping suppliers sell carribean playsand that is silica free (so must be aragonite or similar). 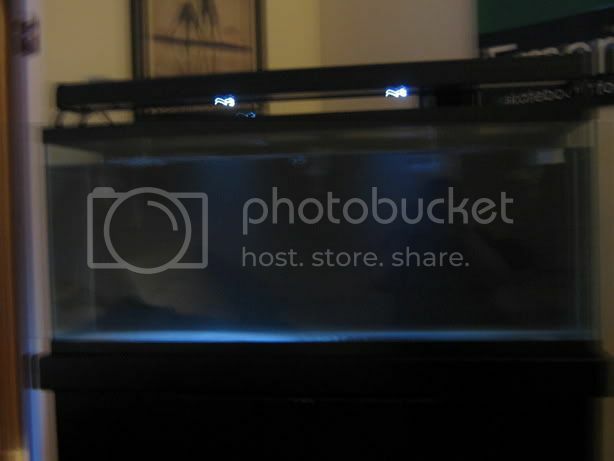 I have read a very interesting article/interveiw about lighting from reefcentral. It is long but alot of good points. Anyhow, looking forward to watching your progress, Good luck. 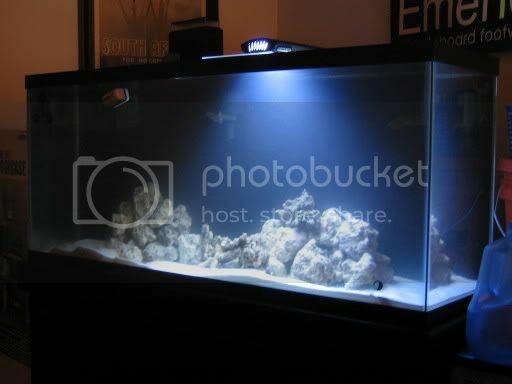 Well the rock is scheduled for delivery on the 26th, so I should have new pictures by then. The base rock was delivered yesterday so I will post pics tomorrow. Well a couple weeks ago I had the light fixture off the tank so I could move around the powerheads and I accidentally knocked over the fixture breaking the bulbs so I will have to order a couple more. I used the 18w fixture from my 2.5g and placed it over the 55 gallon and took some pictures. I added a couple Margarita snails, and Hermits. 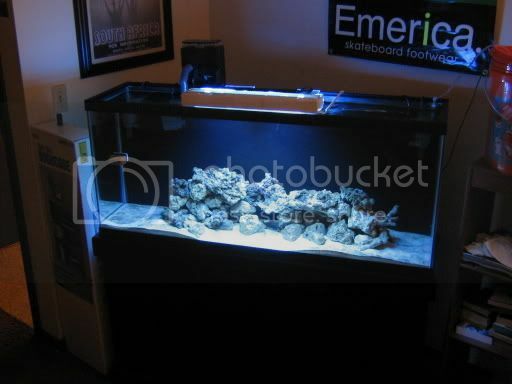 I will be ordering two more bulbs and about 10lbs of fiji live rock in the next couple weeks. The tank is coming along great. 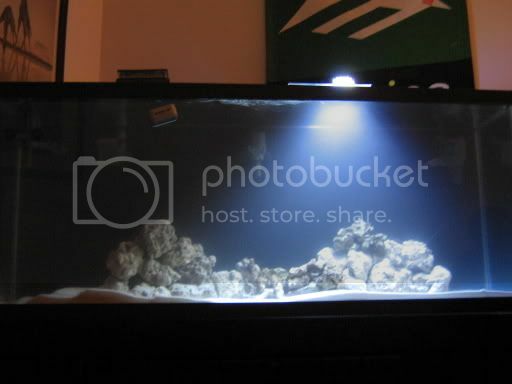 I still don't have the PC bulbs for my fixture, however I placed my 18w PC light fixture and a 18" No fluorescent fixture with a Marine-Glo bulb over the tank to provide temperary light. very nice! 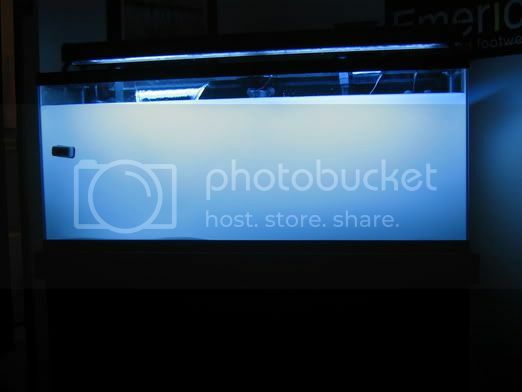 just wondering: is that light in the first pic an arcadia luminaire?